Description: Spicebush provides so much for pollinators and humans to enjoy! Easily grown in full sun to partial shade, the medium sized shrub grows 6 to 12 ft. 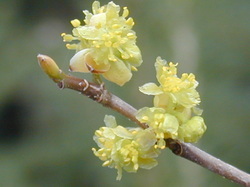 Bright yellow flowers reminiscent of forsythia, but longer blooming, emerge before the leaves in early spring. 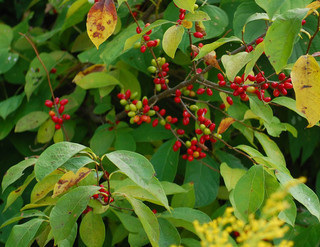 On female plants, these blooms give way to bright red berries later in summer which are enjoyed by birds. The bright green leaves have a 'spicy' scent. The real star of the show however is the spicebush swallowtail, which uses the plant as its host plant for laying eggs. 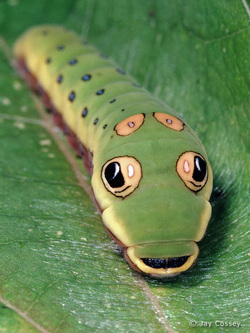 Spicebush swallowtail caterpillars who feed on the plant look like cartoon-ish snakes with big false eyes used to fool and scare away predators. The caterpillar will roll itself up in the leaves of the spicebush for protection. If you locate one and peel back the leaves, it may stick its forked tongue out at you as a warning! Growing Conditions: Easily grown in average, medium, well-drained soils in full sun to part shade. Fall color is best in sunny areas. Tolerates full shade, but habit becomes more open and wide-spreading. Benefit to pollinators/wildlife: Early nectar source for pollinators, host plant for spicebush swallowtail, berries benefit birds and other wildlife. Native Status: Native to northeastern US including Pennsylvania, west to Missouri.